It was February 25th when I did my first post on daffodils this year – nothing extraordinary about that really – but here are two more that are just opening and there are still more that will open in the next few weeks and it just shows that, although people often say that daffodils do not last long, they can be in bloom for at least two months if you plant a combination of early and late varieties. In fact some of the nicest are yet to come. 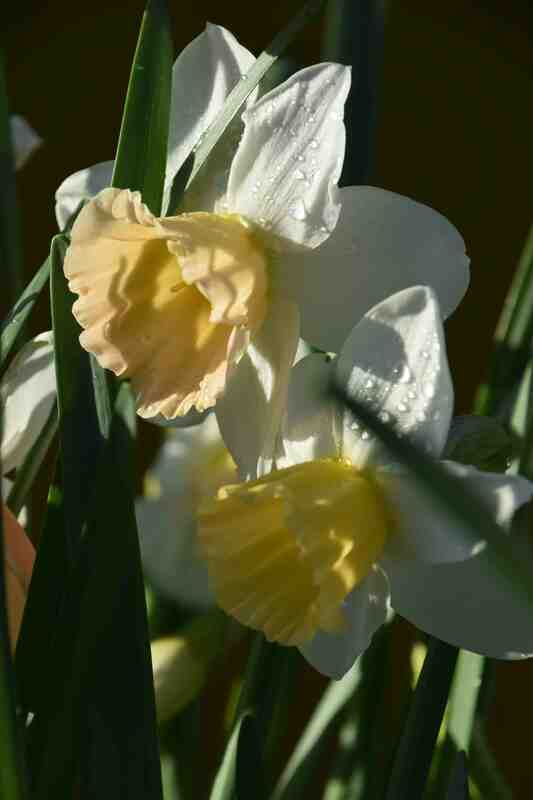 But here is a pairing of two daffodils that I really like: one that is old and I have grown before and another that is fairly new. To start with, the extraordinary ‘Horn of Plenty’ which is one of my favourite daffs although, as I look at it with fresh eyes this year I can see has some features that some people may not like. 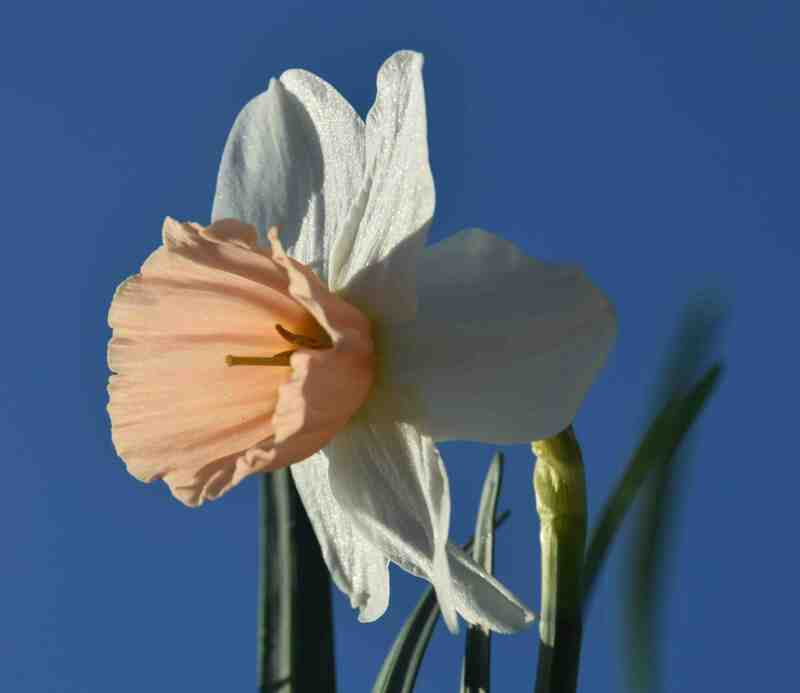 It is an old daffodil, raised by the Dutch Tubergen nursery prior to 1947. It is a Triandrus hybrid meaning that it has clusters of flowers on each stem. 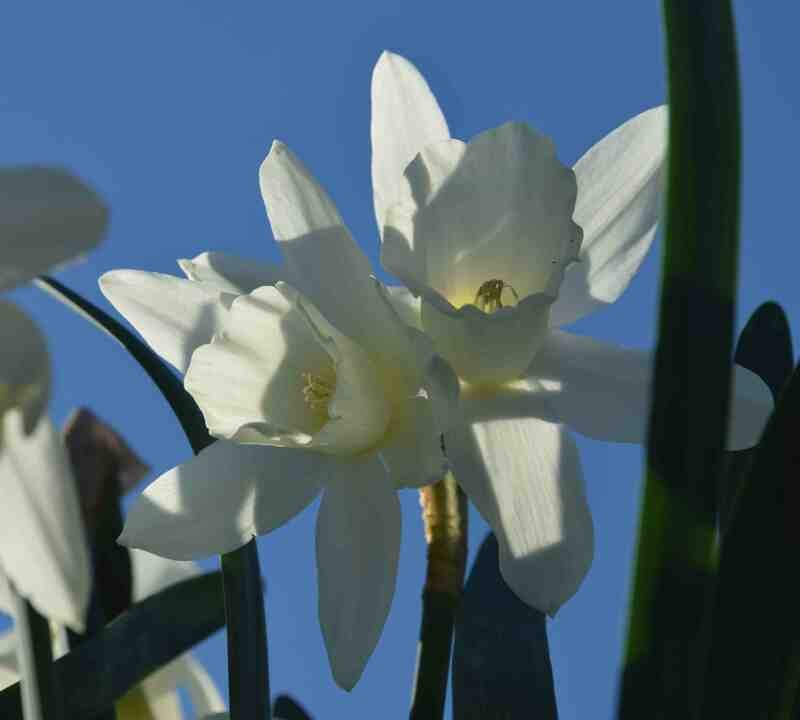 Narcissus triandrus itself has two or three dainty, creamy white, pendent flowers per stem with rather narrow, reflexed petals and a short cup. It is not often grown in gardens but its genes are frequently encountered as the hybrid ‘Thalia’. 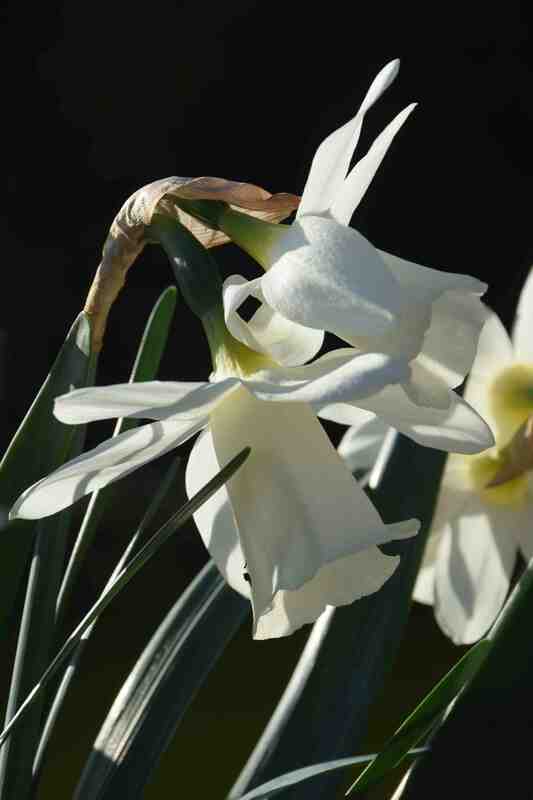 ‘Horn of Plenty’ is a much bolder flower and the petals are not particularly reflexed but what is outstanding is the long trumpet that is distinctly dumpy. It is slightly expanded at the mouth and there is a yellowish tinge at the base. Because the flowers hang down from the stem the green base of the blooms is obvious when you look down on them which you usually do since this is a dwarf variety, less than 32.5cm high – but only just. I like it a lot but I have to say that perhaps the trumpets are a bit out of proportion and when the stems bear three flowers they are a bit bunched. But the stems seem strong enough to support them and, in the past, I have found it to be a good grower. There is not a lot of scent. 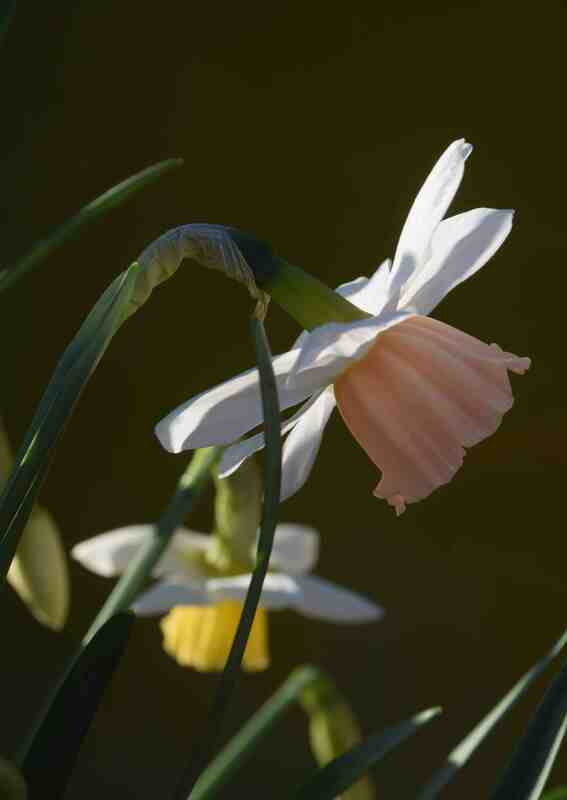 And so on to another Triandrus daffodil that is much more modern. ‘Katie Heath’ was raised by Brent Heath in the USA and was introduced before 2002 and was named after his mother. 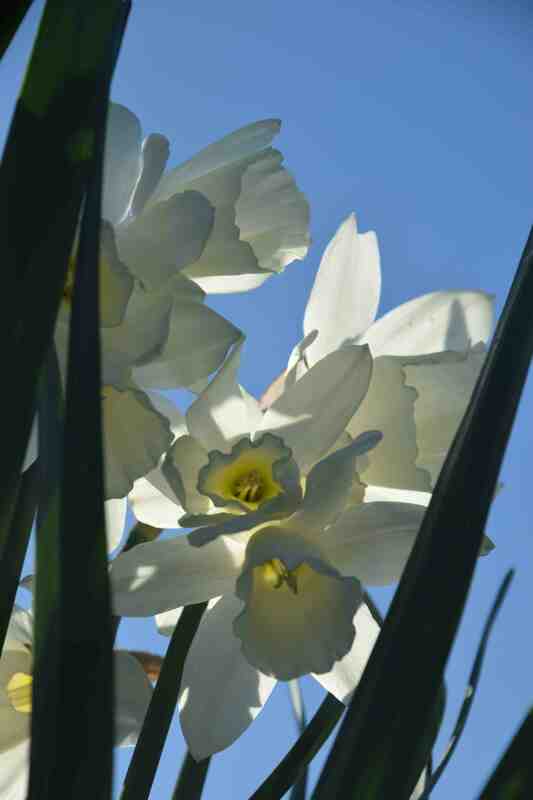 It is also a dwarf and all but the biggest bulbs produce only one flower per stem – there can be two or even three. It is vigorous and produces lots of flowers. They have white petals and an elegantly flaring cup that is creamy yellow when the flower opens but, over the next few days, changes to salmon pink. While it is not the best pink, since a clump will have flowers of various colours until all are fully open, I do like the dainty look of the plant and the vigour of it. There is a slight fragrance.